President Mahinda Rajapaksa arrived at the Paro International Airport in Bhutan this morning on 26th April to attend the 16th SAARC Summit which will be held in Thimpu on 28 and 29th of this month. He was warmly received by the Prime Minister of Bhutan Mr.Jigmi Y.Thinley at the airport. On his arrival Sri Lankan President was accorded an impressive Guard of Honour by the Bhutanese Military. He was accompanied by First Lady Shiranthi Rajapaksa, External Affairs Minister Prof.G.L.Peiris, Secretary to the President Mr Lalith Weeratunga, Sajin De Vas Gunawardena MP and Attorney General Mohan Peiris. The conference of the South Asian Association for Regional Cooperation (SAARC) comprises eight nations in South Asia. Leaders of India, Pakistan, Sri Lanka, Nepal, Bangladesh, Maldives, Bhutan and Afghanistan are expected to participate in the summit. Thimpu Summit is celebrating the 25th anniversary of the SAARC, which was established on 8th December 1985 by the heads of South Asian countries. Later in 2007, Afghanistan also joined the SAARC as a member. The Capital city of the Kingdom of Bhutan, Thimpu is privileged to host the Silver Jubilee SAARC Summit this year. 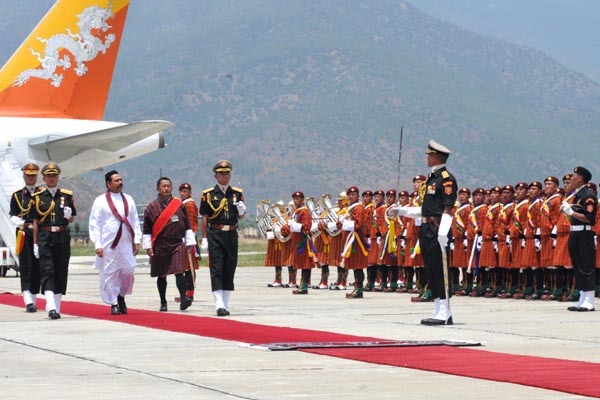 President Rajapaksa is seen here inspects the guard of honour as he arrives on an official visit to Bhutan and also introducing his son Namal Rajapaksa MP to the Bhutan Prime Minister at the airport. First Lady Shiranthi Rajapaksa, External affairs Minister Prof.G.L.Peiris, Secretary to the President Mr Lalith Weeratunga and Sajin De Vas Gunawardena MP are seen here in the pictures.